In order to name the nation’s top franchise, ESPN The Magazine’s annual “Franchise Issue” ranks anything and everything related to major American sports. It takes into account factors from concession prices to winning. This year ESPN named the Memphis Grizzles America’s best professional franchise for 2013. The Mag also researched on-field success, off-field success and traditions of success for every college football and basketball team over the last 15 years. With the help of consultant Jeff Phillips, principal at the Parthenon Group, and alumnus of the MIT Sloan Sports Analytics Conference, ESPN The Magazine editors sought to find the most successful duo in revenue sports. Their findings? Far and away the most successful football-basketball duo since 1998 is the mighty Florida Gators. 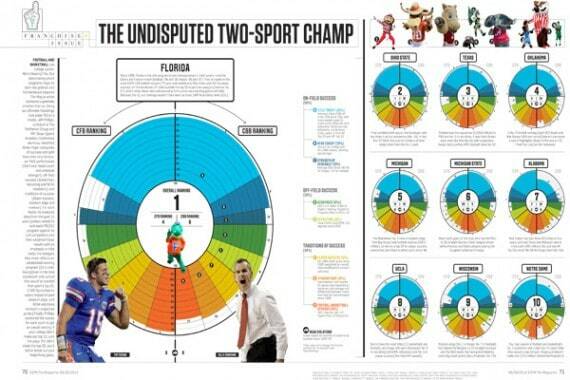 GatorZone brings us ESPN’s rationale for putting the Gators atop the college football and basketball heap. Did the refs blow the fumble call during the Texas vs. Iowa State game?